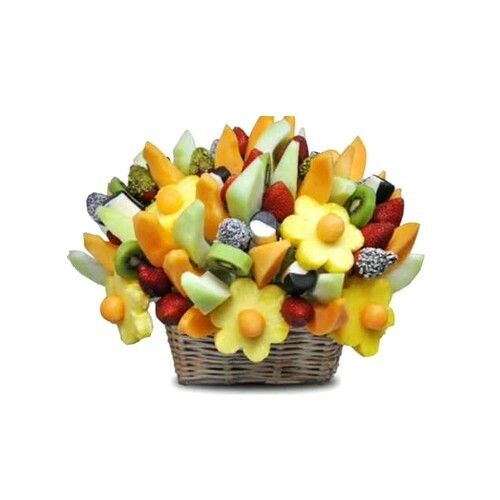 This bouquet features a delicious mix of fruits. Honeydew, cantaloupe rock-melon, pineapple daisies, strawberries, kiwi, gourmet chocolate dipped bananas and chocolate strawberries with mixed toppings. Special Conditions Cannot be ordered with another item, it must go alone, Basket may vary depending on availability. Ingredients Honeydew, cantaloupe rock-melon, pineapple daisies, strawberries, kiwi, gourmet chocolate dipped bananas and chocolate strawberries.